Garden hose repair… is what you will need to do if you do not care for this faithful, often taken for granted garden tool. Daily care of the garden hose (Buying Tips Here), during the season when it is being used, is essential. When you finish watering the garden, landscape or some potted plants on the deck, it is best to drain the hose. Never fold a hose when it’s not in use; instead, it should be coiled to avoid any strain at a fold which could lead to eventual cracking or tearing. Never hang the hose on a thin nail or hook, as that might produce a weakened spot which could result in a crack. A reel is best for the hose when it’s not in use; you could buy or make one. 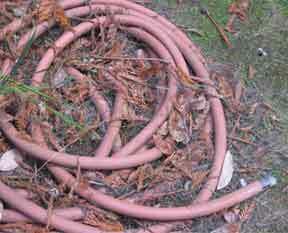 Always store the hose in a dry spot. If the leak in a rubber hose is small, clean and wipe dry the damaged spot; then squeeze on to it a thick coat of rubber-base cement, which you buy in a tube. Let it dry for about 10 minutes, then put on a second thin coat of the cement. Wind friction tape around the cemented part. For a minute or two keep your hand over the tape, to make it stick. Then permit it to dry thoroughly before using the hose for watering again. A plastic hose with a small leak cannot be handled this way; but it must be repaired in the following manner, which is also recommended for big leaks in a rubber hose. Before you proceed with the work on the plastic hose, dip the ends in hot water to soften the plastic and make it more flexible. Whether you are mending plastic or badly damaged rubber hose, the first thing to do is to cut away the damaged portion with a sharp knife. Making straight cuts to insure no jagged ends. At the hardware or garden supply store you can buy a metal splicer or a mending tube with pipe clamps, which are made for the purpose of hose repairs. To use a splicer, insert one end flush into the hose. Slowly tap each prong at a time, until all are set into the hose firmly with a tight grip. Then into the other end of the hose insert the other end of the splicer, and again working carefully and slowly, tap the prongs for firmness and tight grip. To use the mender tube, insert the tube into one end of the hose, then put a pipe clamp onto the hose and slide it 1/2″ in from the edge of the hose. Now tighten the bolt and nut on the clamp with a screwdriver to make it secure. Onto the other end of the hose put the second pipe clamp; then insert the mender tube into the hose; now the two hose ends meet (over the mender tube which is inside). Slide the clamp over to about 1″ from the first clamp; then tighten the bolt and nut on this second clamp.